Looking for something out of the normal for your next layout? What about a North American logging layout? Regular readers will know I have a thing about industrial operations and scenery and they’re my some of my most favourite features to model. Most of my layouts are based on Cornish mining operations as a result. Sadly, industry and natural lush scenery don’t tend to make nice bedfellows. The simple fact is that the construction of mines and associated works usually resulted in the wholesale destruction of natural landscape around them. Rock was dug up to make buildings, rivers were diverted and trees and ground cover were ripped up during construction. As such, my layouts usually consist of mine workings and a port / dock with hilly landscape between the two and which the railway track runs through. This satisfies my dual model making desires while also being true to how things really worked. I really enjoy planning and making Cornish landscapes, with small railways running from a harbour or dock through rich hilly scenery and up to mines, engine houses, ore treatment works and china clay storage facilities. Just recently however I came across North American / Canadian logging railroads. There’s no equivalent of these in the UK so I’d not come across them before but having seen one at a show the attractions of industrial operations embedded within and around natural landscapes and dense forests left me intrigued. The video below shows one such layout. True to life, all the buildings, mills — even the bridges for the track — are timber construction and so have a more natural look and feel than the heavy granite mine working layouts that I usually model. They look beautiful and leave me itching to build something similar. Another attraction of such model railroads for the modeller is that prior to trains the only way to move the timber was by floating the logs down a river or creek. As such, there’s plenty of opportunities to model large waterways. The Englewood logging railway in Canada, for example, ran from Vernon Lake to Beaver Cove on Northern Vancouver Island, British Columbia. There’s a lot on these layouts that will be a huge challenge. The bigger, more dense, trees; huge amounts of wooden building construction and trestle construction and of course the research to understand milling operations and buildings but this precisely the kind of thing I enjoy. Looking at these has also given me ideas for my existing layouts. Chiefly, the use of building materials with the same colouring as the surrounding landscape local to the railway. This is perfectly logical – buildings would have been made from locally sourced materials – and results in a colour matched layout where the buildings and natural scenery blend together. It just looks nicer. I’ll come back to this in a future post. For now, thoughts of my building a North American logging layout are just wishful thinking — I really must finish off one or two of my current layouts first. But if you’re still contemplating what theme to use for your layout, a logging scene should definitely be on your list for consideration. They’re a different to usual rural branch line so common in the UK but, dare I say it, more interesting? Is this something you’d consider? I’d be fascinated to know your thoughts! 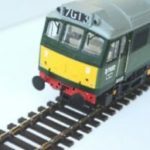 Model railway minimum curve conundrum – what’s the smallest radius? 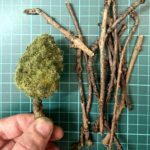 The Cheapest Technique For Making Model Trees – They Look Great Too!